부여 외리 문양전 일괄(扶餘 外里 文樣塼 一括)은 충청남도 부여군 규암면 외리에 있는 옛 절터에서 출토된, 다양한 문양과 형상을 새긴 후 구워서 만든 백제 때 벽돌(전)이다. 산수문전·산수봉황문전·산수귀문전·연대귀문전·반용문전·봉황문전·와운문전·연화문전으로 8매의 벽돌이다. 이 벽돌은 정사각형에 가까우며, 한변이 29㎝내외, 두께 4㎝로, 네모서리에는 각기 홈이 파여있어 각 벽돌을 연결하여 바닥에 깔 수 있도록 제작되었다. 산수문전은 상단의 상서로운 구름 아래로 3개의 봉우리로 이루어진 산이 있고, 하단에는 물이 있다. 전체적으로 배열이 규칙적이며 좌우가 대칭을 이루는 균형잡힌 구도로, 서정적인 분위기를 자아낸다. 산수봉황문전은 구름과 봉황이 있는 벽돌로 상단에 삼산형 봉우리가 솟아있고, 하단에는 산수풍경을 새겼다. 산수귀문전은 산수를 배경으로 상단에 물결무늬의 구름위에 둥근 바위를 딛고 서 있는 도깨비 무늬인 반면, 연대귀문전은 연꽃모양으로 만든 대좌위에 도깨비가 서있다. 반용문전은 구슬을 꿰어서 이은 타원형의 띠안에 S자 모양의 용이 새겨져 있다. 봉황문전은 원안에 우아한 자태의 봉황 한마리를 배치한 모습이다. 와운문전은 연꽃무늬의 작은 원심을 만들고, 이를 중심으로 8개의 와운문이 원을 이루고 있다. 연화문전은 구슬을 이은 타원형에 연봉무늬가 있고, 원 중심의 씨방이 크며 이를 중심으로 10개의 꽃잎이 있다. 꽃잎마다 덩굴무늬를 새겨놓았다. 이 벽돌은 성격이나 만든 방법이 중국 남조의 영향을 받았으며, 일본 오사카에서 출토된 봉황문전 등에 영향을 주었다. 문양전의 모습은 백제 시대 회화를 짐작하게 하는 중요한 자료이다. 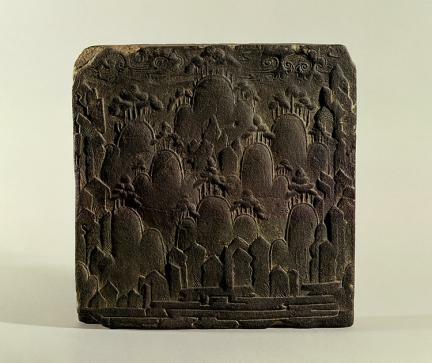 These are tiles from the Baekje Dynasty on which a variety of patterns were inscribed and then baked. They were found in March, 1937 at an old temple site in Oe-ri, Gyuam-myeon, Buyeo-gun, Chungcheongnam-do. They are almost square with about 29 centimeters on a side, 4 cm thick. On the four corners, there are holes to connect the tiles. There are total of 8 patterns: Sansumunjeon (Landscape Design), Sansubonghwangmunjeon (Landscape and Phoenix), Sansugwimunjeon (Landscape and Demon), Yeondaegwimunjeon (Lotus and Demon), Banyongmunjeon (Crouching Dragon), Bonghwagmunjeon (Phoenix), Waunmunjeon (Cloud), and Yeonhwamunjeon (Lotus Design). Sansumunjeon has a pattern with a mountain which has three peaks, a cloud in the upper part and water in the lower part. Generally it has a regular and balanced arrangement of landscape and evokes a delicate atmosphere. Sansubonghwangmunjeon also has a mountain with three peaks in the upper part and landscapes in the lower part. 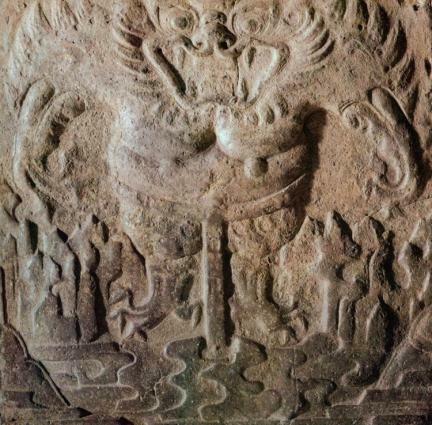 In Sansugwimunjeon, there is a demon pattern on a rock with the cloud pattern like a wave, while in Yeondaegwimunjeon, a demon pattern stands on a pedestal with a lotus flower pattern. Banyongmunjeon has a dragon pattern entwined in a circle of beads. Bonghwangmunjeon has an elegant Bonghwang (phoenix) pattern in a circle. Waunmunjeon has a lotus flower pattern in the center with eight cloud patterns around it. Yeonhwamunjeon also has a lotus pattern in a circle of beads. The characteristics and the skills shown in these patterns were influenced by those of the Southern Dynasty of China, while Baekje in turn influenced Japan. These patterned tiles are valuable materials, because through them, we can make suppositions about the art of the Baekje period.